Runny Poos? Does Your Dog Have Runny Poops? Does Your Dog Have Runny Poos? And if so, how often do they have them? Every once in a while, more than 50% of the time, or almost every time? I know that's a kind of personal question, but really as a dog owner you should be aware of the kind of poos (and pees too for that matter) that your pet has for health reasons. My oldest German Shepherd that I have right now, he's just turned three, used to have normal poos all the time. Then one day he started having bad, runny poos. And this went on and on for a day or two. Keep in mind that there were no food changes of any kind. So I tried treating him using all the methods that I had at my disposal - they didn't help. I called my vet for advice and tried all their suggestions - they didn't help. Then after about 2 to 3 days I took him to the vet to get it taken care of. Now keep in mind, the whole time he started having these runny poos he was still playful, frisky and happy. Had he been sickly, listless or just "off" from his normal behavior I would have taken him to the vet much sooner. Anyway, we went to the vet about 3 to 4 times in a 3 week period trying to get this under control. We did everything the vet prescribed - we used several different types of medicines - they didn't help. We tried special foods - they didn't help. We tried other special diets - they didn't help. We had him tested for EPI (Exocrine Pancreatic Insufficiency) - the test came back negative. The whole time we were going through this process he was still playful, frisky, eating great and happy. So at least we had that going for us. But I certainly didn't want him to get sick too since he was having the stomach issues already. But he never acted the least bit sick, down or like he felt bad. But in the back of my mind I kept thinking EPI. Maybe the test had been wrong? Or maybe he had some thing else going on inside him and this was just the new normal for him. So I started looking for other alternatives to try to get the runny poops under control. I have a friend (human) who has similar stomach issues and got to thinking about what kinds of things people with iffy stomachs might need to keep their issues under control. So during all the vet trips (which had no good results at all) I started visiting a lot of medical websites, some veterinary websites and then started looking at digestive enzymes in particular. I guess the whole EPI issue was still there in the back of my mind. Anyway, I read up on some products people were using on their dogs with EPI. Traditionally these can be really expensive. So I started looking for cheaper alternatives. And then I came across something called Biocase V. This product comes in capsules or as a powder - I got the capsules because I thought it would be easier to administer. As soon as we got them in a few days later I started using them with my GSD giving them to him before each meal. Now we had to experiment with him until we found the dosage that worked for him, but guess what - after almost a month of nothing but runny poos, he had a much nicer one! And then a few days after starting him on the Biocase V, he was having almost normal poos consistently. Halleulah!! So we stuck with that product for about a year, maybe longer, until I came across a similar product while doing research that was highly rated and even cheaper than the one we were using at that time. So I ordered that one too and switched him over to it over the course of about a week. Once we were completely on the new product I was surprised to see that he was having an even firmer poo than before - in fact this one looked completely normal! So we have stuck with that one ever since and still use it today. 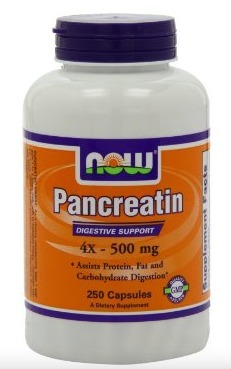 It is called Pancreatin. Now sometimes your dog may have diarrhea. This is no big deal generally and it happens to all of us and to our animals too. Maybe they ate something that didn't agree with them, who knows - but this could be the symptom of several other things too. So if your dog has diarrhea - and if your dog is acting sickly - then then this is exactly the time you need to take your dog to the vet. Or if you're not sure, take your dog to the vet anyway. I would always suggest you err on the side of caution when you just don't know. Better safe than sorry. So the purpose of this article is not to say that you have to buy the most expensive foods on the planet for your dog, or see the vet constantly - but if your dog is active, playful, happy and in good health otherwise, but just happens to consistently have runny poops, then you just might want to try these products yourself. 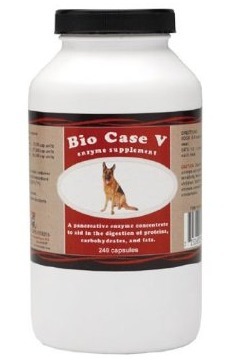 The Pancreatin or the Biocase V are both fairly inexpensive and you just give them to the dog before each and every meal. Believe me, if you forget to give them to them before any meal you WILL KNOW the difference later on if you know what I mean. Anyway, these particular enzymes are natural and just aimed at helping the animal digest their foods. So, if your dog is healthy otherwise, but just has runny poos consistently, you might want to try these products mentioned above for yourself. You will have to experiment with them until you get the dosage right, and they must be administered before every meal (I just give mine to my German Shepherd in a spoonful of peanut butter), but once you get the dosage right and it becomes routine you will be pleasantly surprised at the difference in your dogs poo. So much easier to clean up!